Chairman Lee Kun-hee of Samsung Group, the only Korean member of the International Olympic Committee (IOC), commented that Pyeongchang has a great chance to host the 2018 Winter Olympics in its third bid to win the hosting rights. Chairman Lee made the comment just before the IOC Evaluation Commission left for Pyeongchang to survey the Bokwang Phoenix Park facilities on Feb. 17. The Korean IOC member said the IOC evaluation commission this time felt better after looking around the winter Olympic facilities in Pyeongchang and “we can feel the possibilities rising if we try a little harder.” But, he said, it is a tough and sensitive question to answer when asked how he felt the IOC members would vote this time. The Samsung chairman met with the IOC Evaluation Commission members at Bokwang Phoenix Park Hotel in Pyeongchang and attended the presentations for the free-style ski, mogul courses and snowboard courses. After the presentations, Lee hosted a luncheon for the IOC Evaluation Commission at Bokwang Phoenix Park Hotel for about an hour and half, along with acting Chairman Kim Jae-yeo of the Korea Speed Skating Association. The IOC Evaluation Commission left Korea on Feb. 20. after ending its inspection of Pyeongchang’s third bid for the Winter Games. The delegation, which will inspect another strong candidate, Munich, from Feb. 28, lauded the progress made by Pyeongchang. Most of the evaluators, led by commission Chairwoman Gunilla Lindberg, were impressed with the newly-completed world-class venues and the strong support shown by the local and national governments. Compared to the last two lost bids, seven venues have been constructed including ski jumping slopes and biathlon and cross country courses. 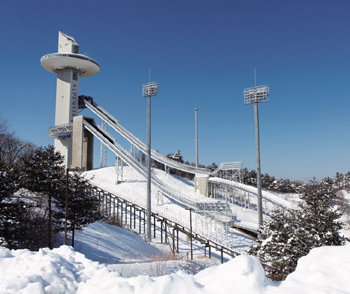 With the delegates being able to confirm that Pyeongchang could keep its promise to build world-class venues, they may also be assured that other Olympic facilities and plans will be completed before the Winter Games starts in 2018. The IOC members saw that the national government was firmly behind the bid after President Lee Myung-bak and Prime Minister Kim Hwang-sik both visited Pyeongchang. Other ministers included Minister Chung Byeong-gug of the Culture, Sports and Tourism Ministry; Minster Maeng Won-hyung of the Ministry of Administration and Home Affairs, Minister Chung Jong-hwan of the Ministry of Land, Transport and Maritime Affairs; Minister Chin Soo-hee of the Ministry of Health and Welfare; Justice Minister Lee Kwi-nam; and Commissioner General Cho Hyun-oh of the National Police Agency. “We could see the strong support from government and realized how the Korean government is active as shown by the visits of the president and prime minister. We especially met many athletes. 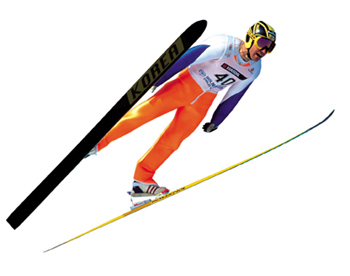 We could feel the passion of the Korea Olympic Committee members,” Lindberg said. The commission members also confirmed that reported support of over 90 percent of the local population was not an error as they received a passionate welcome from residents. The latter could make all the difference in the competition with Munich’s bid ― so far a handful of farmers in Garmisch-Partenkirchen have refused to allow their land to be used for the Games. The market of winter sports in Europe is already saturated, but Asia could turn into a goldmine. To ensure a successful Winter Games, the city, which is relatively less known than its rivals, needs to prepare the infrastructure for athletes and fans. Gangwon Province has already signed memoranda of understanding with 80 brands to secure this, and a bullet train will deliver participants to Seoul in just 50 minutes. In a final press conference on Feb. 19, many foreign reporters asked whether the tension between the two Koreas would affect Pyeongchang’s bid, but Lindberg closed that issue. 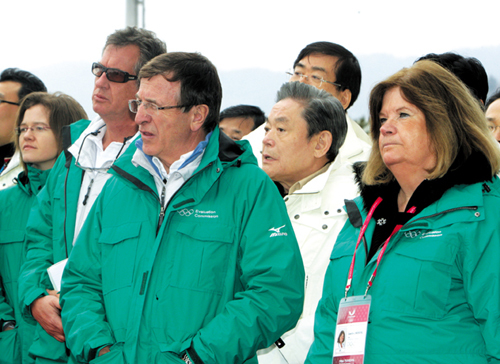 Cho Yang-ho, head of Pyeongchang’s bidding committee, was satisfied with their work. “We’re very pleased that we’ve been able to show the IOC that we’ve lived up to our commitment and that we have strong support from the people and the government for our bid,” Cho said. The IOC’s evaluation report will be made public in May. A positive evaluation could help a candidate city win, but the reports aren’t always linked to a victory. 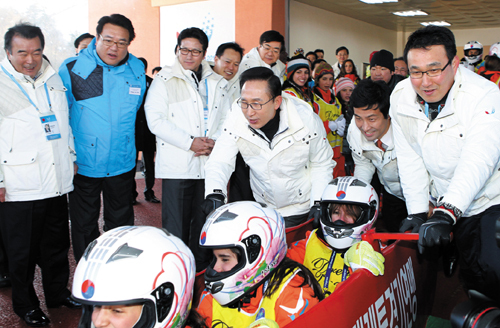 President Lee Myung-bak pushes the toboggan with IOC Evaluation Commission members aboard down the slope at PyeongChang Winter Olympic Game venues in PyeongChang, Gangwon Province. Watching them are Chairman Cho Yang-ho of Korean Air who also is chairman of the PyeongChang Winter Olympic Bid Committee, Minister Choung Byoung-gug of the Ministry of Culture, Sports and Tourism and Presidential Political Affairs Secretary Chung Jin-sok, among others. Chairman Lee Kun-hee of Samsung Group and the only Korean IOC member, 2nd R, joins the IOC Evaluation Commission members including Gunilla Lindberg, the chair of the IOC commission, right. Behind them are Chairman Cho Yang-ho of Korean Air and also chairman of the PyeongChang Winter Olympic Bid Committee, among others.